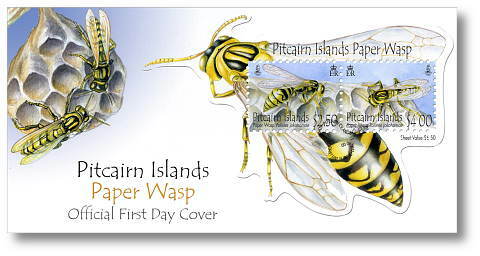 The Paper Wasp issue continues the theme of small creatures / insects found on Pitcairn. Wasps of the genus Polistes are the most common type of paper wasp with over 300 recognized species and subspecies found worldwide. They commonly build nests on human habitation where they can be very unwelcome and, although they are generally non-aggressive, they possess a potentially dangerous sting and can be provoked into defending their nests. The founding stage begins when a solitary female (the "foundress") initiates the construction of a nest. The wasps gather fibre from dead wood and plant stems, which they mix with saliva and use to construct their water-resistant structures. They begin by fashioning a petiole, a short stalk which will connect the new nest to the eave of a house or structure, and building a single brood cell at the end of it. Further cells are added laterally in an hexagonal pattern, each cell surrounded by six others. Although nests can achieve impressive sizes, they almost always maintain a basic shape on a stem, are single-combed, unprotected and open. Paper wasps secrete a chemical which they spread around the base of the anchor to prevent the loss of eggs or brood to predators, especially ants. Eggs are laid by the foundress directly into the brood cells and are guarded. After the first larvae hatch, the foundress feeds them caterpillar flesh throughout their development. This first seasonal brood of new paper wasps is exclusively female and destined to a subordinate worker position inside the nest; they do not create their own nests and instead assist their mother in the care and maintenance of future sisters. Some foundress wasps do not build their own nests, but rather attempt to usurp that of another female. Polistes discriminate between colony mates using an acquired "pheromone signature" which is derived both from the plant material and the foundress-applied substances from which the nest is made. Females do not preferentially feed their own progeny (as larvae), so it may be the case that nest odour serves as the likely indicator of relatedness. The worker phase begins roughly two months after colony initiation with the emergence of the first workers. These new females take up most of the colony's work duties, foraging, caring for brood, and maintaining the structure of the nest. Around this time, those females who assisted in nest foundation (if present) are driven from the nest by aggressive behaviour on the part of the foundress and they leave, either to start their own nest, or usurp another's. The reproductive phase of the colony begins when the first female reproductives emerge from their brood cells. Once male reproductives emerge and both males and females disperse from the nest for mating flights, the so-called intermediate phase begins. Brood care and foraging behaviour declines and worker numbers drop as dying individuals are no longer replaced by new ones. This also results in an increase in aggression and the social cohesion of the nest declines.